You are viewing articles tagged housing. Privately, I’ve been advising home-owning friends and family thusly for the last six months or so: find a moment (and find it soon), to sell your house, put your stuff in storage and rent an apartment for a year (maybe two or three), then buy your house (or one similar) back, for a maybe $200,000 profit. It remains to be seen whether my advice is worth anything (to date, everyone has emphatically ignored it), but for the first part, housing prices are finally starting to crash. Now, listen carefully: it’s time to go shopping. Remember the factors that led to the bubble? Idiotic interest-only mortgages, gross overbuilding, and what seemed like terrifying hurricane seasons as far as the eye could see. The picture today? (1) mortgage idiotics universally recognized and being dealt with to the tune of trillions of dollars from the federal government, (2) overbuilding spectacularly finished, and (3) relatively calm winds for the last two seasons. To boot, (4) an incoming president that everyone seems to think Can Fix Things. Yup: housing prices dropped steadily from 2006 to 2009, at which point they began to level off. The actual bottom came in the second half of 2011, and prices have been recovering fairly sharply since. For the record, anyone who sold when I said and bought when I said really did stand to pocket between $150 and $200 thousand. But so where are we now? We’re at a very interesting time. Florida’s unemployment rate has dropped from over 10% to 8.6% over the last half year. (Not amazing I know! But an improvement over 11.4%, which is where we were in 2010.) From where I sit in Edgewater, development appears to have started up in full force. There’s one condo at the end of my block that was recently finished and is now selling, one across from me that’s being finished up, and an empty lot behind me where construction is just starting. A response to the low inventory I realize, but just a few blocks away is Paramount Bay, a positively huge building completed in 2009 that, judging by the number of lights on at night, sits over 90% empty. Drive around Miami and you see the same everywhere: construction cranes. Could it be true that South American investors are buying up Miami condos to protect their investments? Believe it or not, South America is in the middle of “an economic boom.” Meanwhile, 65% of housing sales in Miami have been all-cash transactions (that’s 77% of condo sales and 46% of house sales). So where does all this add up? If you bought a house in 2009 or 2010, give yourself a pat on the back. Otherwise, I’d be careful right now. Officially, prices are still low. But the condo market makes me weary. And Europe could collapse at any moment, sending us into the double dip that the Sourpuss has been promising us for years, just as Romney is taking office. On the other hand, Europe has been promising to collapse for months and hasn’t (despite pretty close to the worst case scenario w.r.t. Greece). It could shore itself up through the magic of German bonds and we could be in a rosy economic picture just as Obama takes his second oath of office. See? Uncertainty. Home prices continue record declines, with Miami and Las Vegas in the lead, each with 19.3% drop over the last year. Amy lives in Ft. Lauderdale, and the article that quote comes from concerns a story in Palm Beach. I’m not sure whether her logic makes any sense at all, but it for sure doesn’t apply to Miami. Look, keeping people from moving to your town (as if you could) might make housing there cheaper, but it for sure is not good for the economy. You want people to buy stuff, go to restaurants, create the demand for more stuff, and get the economy going. When your local economy is doing good, you have a chance, more then likely, of getting a better job. The above logic may work if you’re on a fixed income, but it’s a downer anyway you slice it. But I digress. The point is that even if all the renters in Miami suddenly started buying condos we’d still be in a jam as a city. Empty buildings are good for laughing at greedy developers, but they are not so good for the economy. We need folks from out of town here to soak up a bit of the excess. I want them here adding to the economy, because I want a fancy new job with a 6-figure salary. So, come on, folks, we’re looking forward to a brief window of opportunity. And you can help yourself, too: move here. If you’re thinking about it, just come. The bubble’s popping, and you can get in on the ground floor with the rest of us. Currently, in the Miami area: 689 foreclosure homes, 97 foreclosure auctions, 4341 pre-foreclosures. Yikes! Be still my heart! : The audio archives of Tropical Currents with Joseph Cooper are online, going back to mid-2006. Thank you to Steve Malagodi and/or whoever made this happen. Check out the show from December 10th, about the housing market. A startling graph, taken from This FIU study [pdf]. Covered here. Related: residents forced out as trailer parks close. I still say this will drastically improve over the next 6 to 18 months, and there are sub $1000 and sub $600 rentals around, but damned if the numbers don’t speak for themselves. What with the current state of the condo market, it’s no surprise that lawsuits are flying back and forth with reckless abandon. Jared Beck uncovers two interesting strains of such suits. One surrounds situations in which condo projects were not completed within the promised 2-year period. In the other, a developer has refused to return $10 million worth of deposits for a project he apparently has no intention to build at all. I’d say that the primary impact of these sort of suits is independent of the result — they will first and foremost fuel buyer’s suspicions, fears, and caution, and push the overall market further into the hole. What's so great about a housing crash? Only 9 units were auctioned, and most came in hundreds of thousands less then what identical units have recently closed for. Luis has more analysis (plus videos of the event), and leaves open the question of whether this is the bottom. Well, folks, it’s not. Reports on the sub-prime mortgage meltdown have that fiasco continuing for about another year, so it’ll be feeding coal to this fire well into next year. I still say this is great for Miami. The housing crash is nation-wide, and steps are being taken to fix the situation, but because it’s worst in Miami, those steps will do little more then soften the landing a tad. Consider the internet bubble of the 1990’s: one of the results was that insane amounts of fiber optic cable were laid down, much more then it made financial sense to do. The result is cheap broadband for everyone (and a hosing for greedy companies). The result here? Well, a hosing for greedy developers, but cheap condos for everybody! (With fancy lofts and primo stainless-steel appliances, natch.) Workforce housing? Give me a few more months, and I’ll have all the workforce housing you need on tap for ya. The CANDO arts neighborhood got a preliminary vote of approval by the Miami Beach city commission yesterday. It establishes a neighborhood (see map, above) in the northern part of South Beach where the city intends to help the arts flourish by . . . well, allowing developers to build condos with smaller units. Specifically: buildings on the Beach normally must have units that are 400 sq. feet minimum and 550 average. In the district, the latter requirement would be waived, allowing buildings of all-400 sq. foot units, for developments where 25% of the units are set aside for artists and those who work for non-profit arts organizations. Qualifying residents would have to make 50% to 80% of the county’s median income (which is $39,100 for one person, $44,700 for a household of two, and $55,900 for a family of four). The linked article above, and the longer piece in the Sunday Herald, report that it’s 80% to 120% of median income. My information comes from the city’s planning board documents [pdf], which I take to be correcter. Much of the complaining seems to revolve around the fact that the 80-120% is too high, so I wonder where this’ll go. It’s a common refrain that artists increase land values with their presence and price themselves out over time. And while the specifics of this plan open it to criticism, I think it will actually have a positive effect over time. The map shows that their is a substantial arts presence in the neighborhood already, and indeed rental rates on the beach are sometimes pretty reasonable. The Herald argues that the HUD takeover of Miami-Dade County’s Housing Agency is unjustified, because the agency was in the process of mending its ways. Of course the sentiment that it’s quite well justified will persist. More here. Those closely following the housing market you can plumb the latest quarterly figures. Keep in mind that all the talk about the market nationally right now is relatively irrelevant for Miami, which is often cited as an edge case. “Second quarter earnings for [Miami Herald] publisher McClatchy Co. fell 9.3 percent, a drop the company attributed to weak advertising sales.” The real-estate slump gets a big share of the blame. BoB confirms my suspicions, that it might be a good time to look around for a new apartment lease: “The current influx of condo units is creating a glut in the rental market as well . . . This is good for renters in that it places lessors in a competitive bind. Some owners are so desperate to lease out their units that they are resorting to transient occupancy for tourists.” This trend will accelerate over the next 12 to 18 months, as more and more under-construction condos come online. I don’t get it: over a number of years, property values have shot through the roof, and property taxes have followed. The current tax reforms are intended to roll back some (not all) of the disproportionate increases. So why is everyone in such a crisis mode? Dark side of the Boom, a documentary about the housing crisis in Miami, is screening tonight at Barry University. T.M. Shine on The Artpartments/Kunst Motel, an apartment building that Blair Russell renovated and turned into live/work spaces for artists. “While renovating the former crack house into an art house, Russell discovered the walls of one apartment were filled with machetes.” Here. Artspace is an organization that renovates old industrial buildings and turns them into live/work spaces for artists. They’ve been doing this all over the country since the early 90s; the Tilsner is a good example. 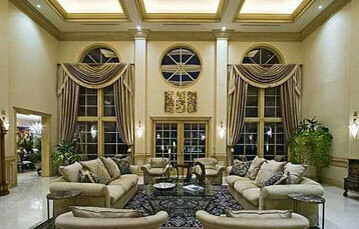 Typically they purchase an unused old building with high ceilings, big windows, and lots of potential. They renovate, creating units suited to various functions: painting studios with high ceilings, soundproof units for musicians, sprung floors for dancers, etc., and then lease them to artists for “permanently affordable” rates. Having a large group of artists living and working together in one place is not only good for the artists, but it usually revitalizes the whole neighborhood. Unfortunately their project in Miami has fizzled out, but they’re building one up in Ft. Lauderdale, here. Unlike their typical projects it’s built from scratch, but it’s in a cool little neighborhood, walking distance from downtown. They’ve set up a website for the space, and it looks like units are going to rent for anywhere from $575 to $1,100 per month (the latter is for 3-bedrooms). The reason I’m writing about this now is that next Tuesday, May 15, there’s going to be a meeting for those interested in living there. It’ll be at Artserve, here, at 5:30 pm. There’s more information at the project’s page on Artspace’s website. What's up with property taxes? Thank you to Jim DeFede for saying what I’m been thinking: property taxes are a good thing. First of all, exchanging property taxes for a increase in sales tax is a horrible shift of the tax burden from the rich to the poor. “Under Rubio’s plan, you might save a couple of thousand dollars, but Rush Limbaugh for instance, will save almost a half million in taxes every year on his Palm Beach home.” That’s a half a million that either gets cut from city budgets (and “disproportionately” is the key word there), or gets paid by people buying diapers. You know how you did your taxes on Tuesday evening (oh wait, that was me)? Well, remember when you got done with the federal income taxes and you went on to do your state income tax? No: you don’t. That’s because Florida is one of the seven (count ‘em) states without an income tax. “Thank you, Walt Disney World,” my old boss used to say. Thank you Limbaugh, too. Thanks to the homeowners. And don’t worry — us renters have seen our rates go up plenty over the last few years, so it’s not like we’re not paying our share. You’re squeezed between rising insurance rates and increasing property taxes? Oh, I’m sorry (the latter is because the value of your property has skyrocketed over the last five years, by the way). It turns out that you live in a tropical paradise, to which 400,000 new people move every year. Oh, and we have hurricanes that come and wipe out a neighborhood or two every couple of years. That makes it expensive. You can’t stand the heat? Well, you should have sold your house at the beginning of last year like Critical Miami told you to do, and you’d be sitting on a big pile of cash right now waiting to buy again when prices bottom out (or maybe moving to a nice quiet little town in Colorado). Or you can trade down from the huge house you can’t afford to a smaller one you can. Then the overall housing prices won’t effect you as much. Look: governments do things. They mostly do things that everyone benefits from, but which individuals would not independently want to spend money on (like educating our kids, for which Florida spends less per child then any other state). We can talk about re-calibrating the rates, but until everyone suddenly decides they want to live in a truly limited-government, libertarian society, I don’t want to hear any more whining. Get out there and mow your lawn. Eye on Miami has a post titled “Miami housing crash bubble” about every day, but this one is worth reading. NicFitKid says: “A plywood wall listing the missing residents of the demolished Scott-Carver housing project. The county came in the next night and fenced off the whole property. Unsafe structure, and, oh yeah, political embarrassment (can’t be having any of those, it’s against code).” More here and here. “For Sale. 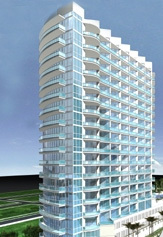 Land, plans and permits for [a big Miami condo project]. Includes fully equipped sales center.” A great Reuters article on the popping Miami condo bubble, with lots of brain-bending numbers (77,000 condo units are still scheduled to be built in Miami; 1,900 have been canceled) along with the prediction by Jack McCabe that it may take 5 to 10 years for the prices to bottom out. Selling your house in Miami? It’s time to get desperate. “[Offer] a ‘buy house now, get a Caribbean Cruise later’ sort of incentive furtherance.” Riiiiiiiiiight. Here’s an issue that a lot of people are disagreeing about: the Crosswinds development for Overtown was just approved by the Miami City Commission. Since the Herald’s open comments seem to be a thing of the past, it seems worth getting into here. What we have is a big mixed-use project, mainly residential, now approved to be built in one of the city’s poorest neighborhoods. Hundreds of people showed up to either support or oppose the project. On the pro side, obviously, is the observation that the development would be an economic boost to the neighborhood. Those opposed (who included Arthur Teele) say that the project would hurt the character of the neighborhood, raise property values in the whole neighborhood, and kick-start gentrification. The question is whether, with the Performing Arts Center, places like Karu & Y (here), and even historical renovations like the Lyric Theater, gentrification isn’t inevitable. Otherwise, it’s worth pointing out that the plan seems to follow Miami 21 principles; the tallest buildings are on the side of the busy boulevard (exact address? ), with a height-transition down to the existing houses and apartments. Of the 1,050 condo units in Crosswinds, 112 will be “heavily subsidized” (up from the 50 the developer was originally offering), and another 210 will be partially subsidized. Hardly makes a dent in the 1,200 new subsidized units the city wants for the neighborhood, and doesn’t really square with the 50/50 market-rate/subsidized ratio that was previously discussed, either. This is peculiar, since by my reading the city gave the developer the land. Two lawsuits must be resolved before construction can begin, one of which was brought by the Power U Center, the folks who brought the 25-foot inflatable rat to the commission meeting. Should be interesting. 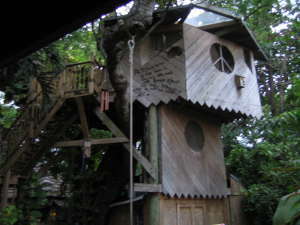 Treehouse room for rent: $300/month, includes utilities. Related: Why renting is wiser. This is what real estate agents are turning to now to help sell houses: burying statues of St. Joseph on the property. The bad news that it demonstrates where we’re going. The good news is that it’s funny, and that it works! Feds to help fund affordable housing. Hmm, let’s see: ”$82.9 million . . . part of $11.5 billion in [Community Development Block Grant] assistance [Secretary Alphonso] Jackson allocated to Florida and four other Gulf Coast states in January to support the region’s long-term recovery.” So . . . am I missing something, or are they graciously planning to give us less then 1 percent of the allocated amount?? An article in the Herald, which I point out mainly because the central question, “What do the activists want?” cannot be answered by skimming the article. Try it. Maybe because five writers on one story (two in the byline, three as contributors) is just too many cooks in the kitchen. Update: Hey, I think this is what Overtown is talking about. For those interested in an overabundance of information on the housing market, SFBJ does an extensive writeup of a recent report done by Metrostudy. Dig in. Still think it's an adjustment? I’ve said it before, and I’ll say it again: we’re in for some affordable housing in the MIA. The Herald would have us believe that housing prices are basically stable. Robert is more thoughtful, but basically sings the same song: that housing costs may not continue to rise as they have, but that we’re looking, at worst, at a correction. Ladies and gentlemen, feast your eyes on the actual numbers. We have inventory increasing. We have prices falling. We have the rate at which they’re falling increasing. What more do you want? How about Miami’s cost of living, now 15.5% over the national average? How about the insurance rates, which as any homeowner knows have shot up over the last 18 months, but are due for more major increases? 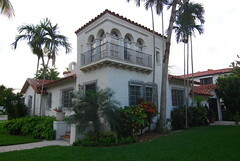 How about “Forbes calling Miami one of the country’s foreclosure hotspots? And don’t get me started on the condo glut. When those 2-bedroom suites on Biscayne are going for $175K, you think it’s not going to spill over onto houses? Break me a give. Read this for a taste of what’s in our immediate future. Update: John brings up a good point; this discussion is slightly impoverished without a reference to Steve’s analysis of the relationship between housing costs and wages. Who's afraid of buying a house? I dropped a hint of that a few weeks ago, but nevermind; the Herald has a full on analysis, including an interactive applet, the gist of which is: the bottom’s dropping out! There are, for instance, 15,080 [condo] units under construction in the city of Miami alone, compared with 11,241 built in the entire past 10 years. And that doesn’t even count the more than 28,000 units approved to go up in Miami. Sooo…. if you just bought a house, congratulations: you’re living in the place of your dreams, carefree. (Just don’t obcess too much about its value.) If you just sold a house, you probably did so at exactly the right time (it might not be too late yet). If you’re thinking about buying, waiting a couple of years might make you look very smart.